Happy 2017!! Hope you all enjoyed your holiday! The break was much needed for us and I loved every minute spent with my family. Monroe made his entrance into the world on November 13th and he is such a joy!! We are over-the-moon in love with him and Romeo has been a wonderful big brother. The adjustment for all of us has been really easy, thank goodness!! It’s been a bit of a whirlwind with the holidays, a lot of work and feeding every 2 hours, around the clock. I didn’t take a maternity leave, so it’s been crazy, hence the reason Monroe didn’t even have an official birth announcement on Sugar and Charm like his older brother did 4 years ago! Mom fail! 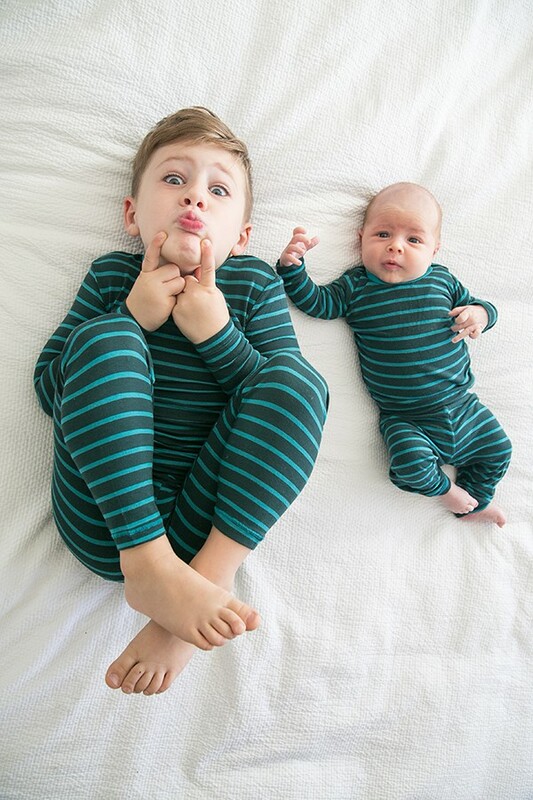 We did manage to do a quick little photoshoot with both boys, really because I couldn’t wait any longer to put them in those matching pajamas! Poor Monroe lost his hair a week after he was born, but it has grown back in the past few days so he’s looking very suave these days. More pics to come! In other news, I’m very excited to start a new year! At the beginning of every year, I write down my goals for what I want to achieve. It gives me some direction and since I’m a goal-driven person, I try hard to achieve them!! In 2017 we’ll be producing more videos, which I’m excited about! And in just a few weeks, we’ll be switching over to our brand new site that we’ve been working on for 5 months! So many fun updates and really just a new overall look for Sugar and Charm. I can’t wait to show you all! I’ll be writing about studio/house updates this year, more travel and of course parties, yummy recipes and easy entertaining! Here’s to a charming 2017! 2 responses to Happy 2017! Congratulations! I was wondering about your litte arrival. He is darling along with big brother! Thanks for letting us know. Happy new year to all!